The event coordinator course is the best course if you possess the organizational skills, communicational skills, creativity skills, multi-tasking skills, and client service skills. 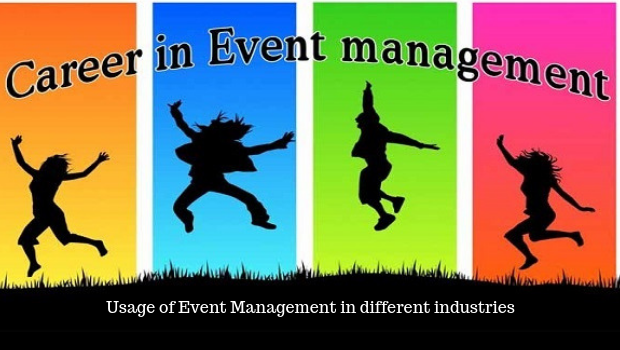 Let me discuss in detail about the Usage Event management in different industries. As per the report from the Bureau of labor statistics, the average salary of an event coordinator is $45,260 which shows that there are huge opportunities in the event management industry. By the year 2020, the salary of the event coordinator is expected to rise by 44 percent. Event management, sports management, hospitality, and tourism degree, and business administration degree are some of the educational qualifications which are suitable for the event managers. If you have a plan of doing the event management course then it goes for four years and the other option available is to do the event management certification program. There are many streams in event management such as event coordination, marketing, fundraising, decorations, and risk management. Let me see in detail about the skills required for the different branches of the event management. Cultural celebrations, arts and entertainment, business and trade, sports competitions, recreational, educational and scientific event and political and state event are some of the diversifications in the event management. The hotel industry, the travel industry is the industries where the practical knowledge and an attention to the detail are important. There are so many types of events in the hospitality industry like mega-events, hallmark events, major events, and local events. Mega-events have global impact whereas the hallmark event is an event with distinctive quality of the program. The sports event managers possess good creative skills and there are so many areas to show creativity like the design, audio-visual production, scriptwriting, logistics, budgeting, negotiation, and client service. Apart from money the time management is the most crucial part in the event management as it has tight deadlines. Entrepreneurship is the base for the business and there are so many types of business events in the corporate world. The different types of corporate events are seminars and conferences, trade shows, executive retreats, golf events, appreciation events, organization milestones, team building events, product launch events, board meetings, and shareholders meetings. Event management is highly needed in the small business and in the big business. Poor communication or miscommunication, poor planning, lack of planning for the transport, lack of manpower are some of the common mistakes in the event management. Event management is about making an impact and once the event is over then the event managers get a reward for their long work. Event management job is to make others happy which ultimately provoke the sense of being happy. Event managers are the creators which boost the confidence and the inner passion of an individual. There is an opportunity to travel to amazing places around you for the event management and also meeting different types of people makes the job interesting one. Your post is very useful for me.Thanks for your great post. Keep updating….. Excellent post, truly well post. It will be used for improve our self. Thank you for sharing this content…! good work done and keep update more.i like your information’s and that is very much useful for readers. feeling so good to read your information’s in the blog. Really helpful post! Seems like you’ve well researched to write this article. Regards to your great effort. Looking forward for more such posts from you. Well written article with clear explanation. This article is worth reading. Thanks for taking your valuable time to share this with us. Eagerly waiting for your future write-ups.